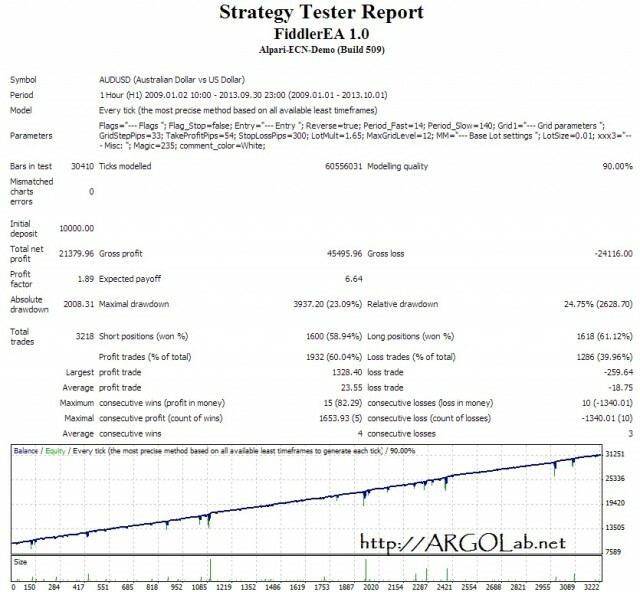 Fiddler EA – multicurrency forex robot for MetaTrader 4. Flag_Stop (TRUE/FALSE): If this flag is set to TRUE, EA will not open new trades after the current basket is closed. Reverse (TRUE/FALSE): If Reverse = TRUE, the first entry is counter-trend; if REVERSE = FALSE, the first entry is the trend-following. GridStepPips: The distance between the next grid levels in the basket, in standard (4-digit) pips. 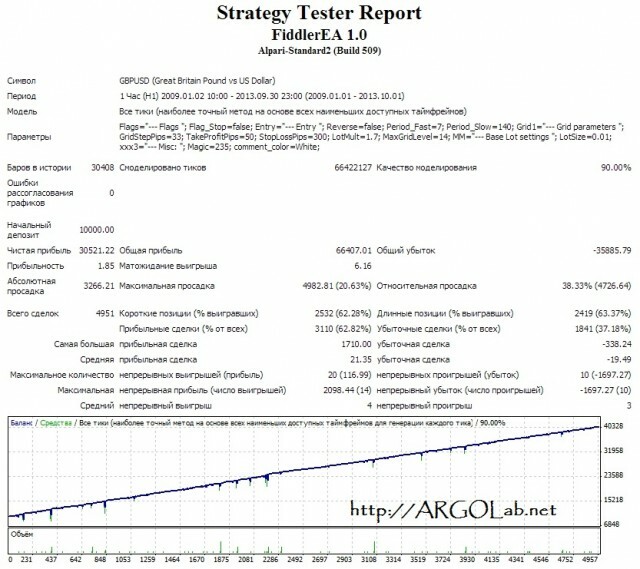 TakeProfitPips: The TakeProfit level of the basket, in standard (4-digit) pips. StopLossPips: The StopLoss level of each order in the basket, in standard (4-digit) pips. MaxGridLevel : The maximal number of grid levels allowed. LotSize: The value of the first order in the basket. Looking into your other EAs, the performance Finddler caught my attention. Can you please let me know if those results are being achieved by running the .set files that come with it or are you guys using different settings on that account? Looks like the EA was stopped since there are no trades since middle May. Hello I am writing you because I telechargez your EA fiddler 1.1 free and I am know on what time frame it is most perform. I must say that I used in the test H1 adjustment that I recovered in the Atlantic but the result is not what I expected. tell me how to parameterize? that is based on the time frame there is an adjustable or that the same adjustment as that contained in the test? 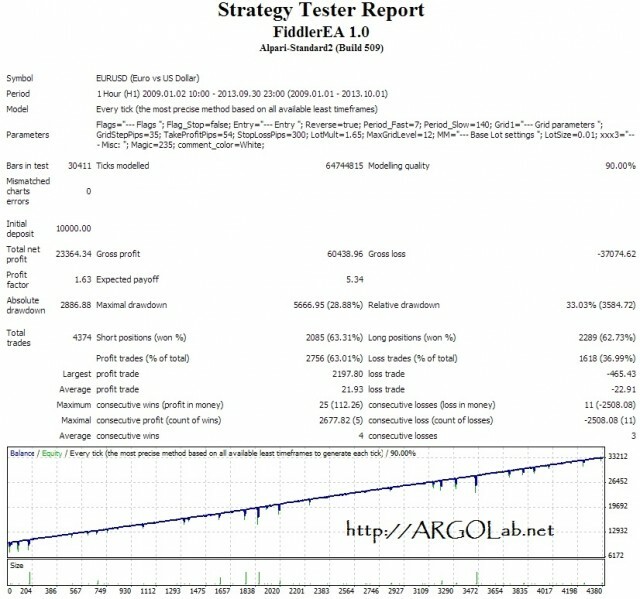 Finally is that I can have a lab with EA argo that is able traded on an account of $ 100 and able to make a profit of $ 10 daily? Finally is that I can have a lab with EA argo that is able traded on an account of $ 100 and able to make a profit of $ 10 daily? Since you seem to be new with martingale EAs, I recommend you to use the preset settings provided with EA. The trading logic of EA is described here Пожалуйста, войдите или зарегистрируйтесь для просмотра ссылок. EA can be used with any broker. It does not need any nonstandard indicators. But this is a martingale strategy, so be aware of risks. That's funny, but this EA survided surely even with the doubled starting lot. By the way a lot of accounts controlled by commercial EAs (Warrior and even Splitter) suffered from signifacant losses or were blown out. ... does not show a comparable large drawdown like theother fiddler accounts in august/september 2014. Could you give me a hint why you think this is the case? In order to survive such directional moves as we have seen recently, EA needs - beside good settings - also some luck. Even with the same settings, you might have very different results on different accounts. This is why we recommend to our users to split deposit in parts and trade different settings/different strategies on them. Hi, I'm testing your Fiddler and I'd like to know if toghether with Fiddler I open manually some trades on the same cross, Fiddler take care of these trades or not? I have been testing your Fiddler EA in recent weeks and have to say I am most impressed with the EA. Having looked at the grid idea in more detail, I was curious to know if a small hedge in the opposite direction of the initial opening trade position might be something to build into the system. The theory behind this is that as the price moves against the direction we would like it to go in, a smaller trade can take advantage of the draw down and bank money when price moves against us from one level to the next. As a new pending order is opened at the next level, another small hedge is opened and again closed if the next pending open order is hit and this continues for however many grid levels are set. When the price moves back in the right direction, the EA closes once the relevant TP is hit and the hedge also closes out for a small loss but overall, there is a still a profit made. I would be most happy to explain in more detail the workings of my idea assuming this is of interest. KROOL1980 и loopsider нравится это. Regarding hedging, ultimately, one has to decide between two choices (1) random entry = always in the market, (2) entry by signal. If one chooses the (1) variant, hedging is a natural option. Пожалуйста, войдите или зарегистрируйтесь для просмотра ссылок works this way, it stays in the market 100% of time and it trades both directions simultaneously. Fiddler uses the (2) variant, and in this case the signal gives you the direction to trade. You can disable signals by using Flag_BuyNow and Flag_SellNow flags, in this case you will be able to do hedging. Happy New Year to you all. I have two questions. The first one is regarding the Flag_BuyNow and Flag_SellNow flags. I ran some back tests with the variables set to true for both buy and sell but the EA only ever took buys trades. Is this the right setting or have I done something wrong. Secondly, the markets opened on Sunday and gapped quite considerably. The EA wasn't running but how does it handle trades if such things do happen? IE: does it try and open pending orders at the relevant lot sizes or does it just remain in the market with existing trades and then look to open new positions if price gets back to where it should be in the sequence? Happy New Year to you all. I have two questions. The first one is regarding the Flag_BuyNow and Flag_SellNow flags. I ran some back tests with the variables set to true for both buy and sell but the EA only ever took buys trades. With Flag_BuyNow set, EA will always buy. With Flag_SellNow set, EA will always sell. If both flags are activated, EA will always buy since Flag_BuyNow is checked first. Secondly, the markets opened on Sunday and gapped quite considerably. The EA wasn't running but how does it handle trades if such things do happen? IE: does it try and open pending orders at the relevant lot sizes or does it just remain in the market with existing trades and then look to open new positions if price gets back to where it should be in the sequence? EA does not have a gape protection system like Forex Warrior. Large gapes may lead to slippage of the pending order and the basket may close in loss because of this. But this is a rare situation. Is it minimum deposit $6000 for 0.01 lot per pair, or for the 7 pairs that set files are provided?